This week, I’m sharing my journey through Ephesians 6:10-17 with you. Today, we’re only looking at verse 12. People are not our problem. That could be a shocker right there. I know most of the time, I think people ARE my problem. But no, the Bible says our struggle isn’t with humans. Instead, our struggle is against the powers of this dark world and the spiritual forces of evil. Stick with me here. I know it sounds like a sci-fi flick. We’re not talking Darth Vader here. But I will say, it sounds similar. We are in our own war with evil. So who are the spiritual forces of evil and the powers of this dark world? Satan and the angels that follow him, better known as demons. Our real problem: Satan and demons. But we often don’t recognize the dark side of evil — because it imitates the light. 2 Corinthians 11:14 — Satan can transform himself into an angel of light. I Peter 5:8 — The devil prowls around to devour you. John 8:44 — Satan is the father of lies. However, even as Christians, we can let Satan deceive us and make us miserable. Lord, open my eyes to the devil’s schemes in my life. 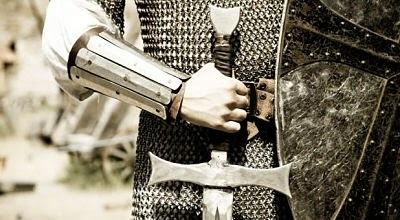 Help me put on the armor and stand strong.